Smiley was first created by Harvey Bell. He was a freelance artist and his creation adds a more human element in today's blogging world. This simple script lets you add facial expressions along with your comment as Blogger itself doesn’t give us a way of doing such things. You can now add some Smileys to your comment form. 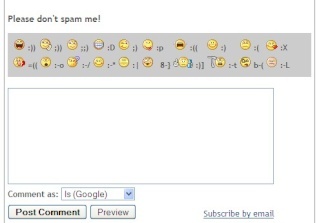 Before I go into more detail, in order to make smileys work you must have a new comment form installed. If you don't have one yet, please read this article. Go back to Layout> Edit Html. Look for Expand Widget Templates box and check the box. Move down to the bottom of your template, search for the closing body tag </body>. Then, place this code immediately right before it. And you're done! You can now express your emotions and let all your feelings out :wink: Please spread the word if you value what you find in this site. Let me know if you find any errors and do leave some comments. Note - This tutorial is meant to explain how to add Smileys to your embedded comment form only. Posted by Is | at 3:53 PM | Labels: Blogging Tools | Estou lendo: Embedded Blogger SmileysTweet this! | Feed. I had a trouble installing this. I got an error message saying "Your template could not be parsed as it is not well-formed. Please make sure all XML elements are closed properly. XML error message: The element type "div" must be terminated by the matching end-tag". Can you help me out with this one?